When it is time to sell or rent out your property, the way you advertise it is everything. You need to get the word out to as many potential buyers as possible to increase your chance of getting the most profit. However, advertising may not be your area of expertise. 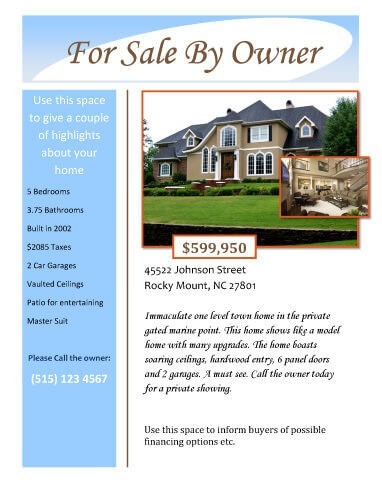 Using our real estate flyer templates is a free and simple way to market your property. 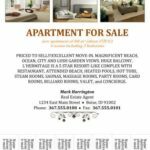 Why Use a Real Estate Flyer? Buyers don’t have the time to go see every listing in person. So your real estate flyer will be what brings them to your property. The information on it will have to catch people’s interest and make them want to take the time to schedule a viewing of your home instead of the thousands of others on the market. Potential buyers typically have a type of property in mind that they are looking for, whether it be a single family home or studio apartment, and marketing your home with a great flyer could help it to stand out from its competition and attract multiple bidders. This could help increase the sale price of your house with a bidding war. If you are an agent, you could also use the free real estate flyer templates for your clients’ listings. This would save you a lot of time and effort, rather than creating each flyer from scratch when working with multiple clients to sell their properties. The flyers will not only aid in selling the property for your client but also as a marketing tool for your real estate business. The free real estate flyer template will have your contact information on it instead of your clients’. Therefore, even if a person is not interested in the house on the page, they may see you as a potential real estate agent to partner with in the future. The more you market the flyer for the sale of your client’s property, the more you will be marketing your business. With that in mind, make sure that both you and the client are sharing the flyer as much as possible. That means on both of your social media accounts as well as around the neighborhood. As you create your free real estate flyer, there are some essential items that you must include on it. These sections will give the potential buyer the information they need to decide if your property is worth further consideration. 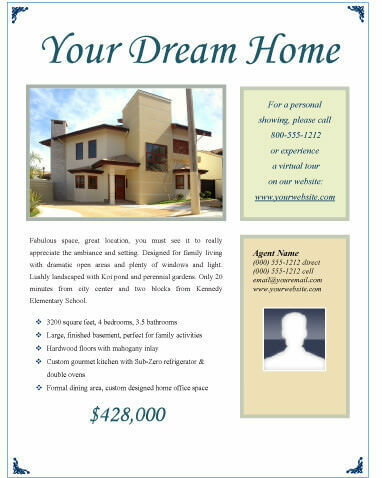 Their time is valuable so your flyer should be what makes them choose to attend your open house or schedule a viewing. 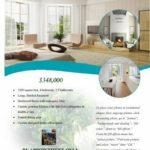 The content on your free real estate flyer template is broken into two important groups: images and text. Contemporary design with six images and key info table. High-quality images will draw people in more than anything else. By looking at these, the potential buyer will immediately get a sense of whether or not the house is what they are looking for. Aim for at least one photo of each room. Since the visual aspects of a flyer are the most likely items to attract people to an open house or showing, many sellers will use a real estate photographer to get the highest quality images. If you are taking them yourself, use these tips from real estate photographers on Fit Small Business. Use a wide angle lens. This allows you to get more of the room in the photo and create a sense of depth. Take them from the best angle to show space and light. Dark photos will make your home look dreary and small. Take photos horizontally for best viewing on the flyer. This will allow you to show off more of the room as well. Prepare each area you photograph. Make sure it is clean and any clutter is removed. Use a tripod. This allows you to use a slower shutter speed and get more natural light in the picture. The real estate flyer should not include too much text, so you want to make sure you are listing the most important information. When prospective buyers see the flyer, they will likely just have time to skim through it. Make it easy for them to see the most noteworthy features of your property, such as how many bedrooms and bathrooms it has, by using short and simple bullet points. Lastly, but most importantly, list the best way to reach you. It should be easy for anyone to find your or your real estate agent’s contact information, or they may give up on trying to schedule a showing. The design of your flyer will also have an impact. If it is too crowded, it will leave a negative impression, just as an overcrowded room would during a showing. Using our template designs will help you to get a balance on the layout. The design process will also include choosing the right font. You need one that is visually pleasing as well as easy to read. Try to stick to that one for the flyer, but if you feel you must use more, keep it to no more than two. According to Brochure Monster, the following are good choices for legible fonts. All the information you include on your real estate flyer is crucial, but the title is going to be the text that is read the most, since it will be in the largest font and at the top of the page. If people are in a hurry, they may simply glance at the header and only read the rest of the page if that catches their attention. Real estate marketing has has changed and instead of posting physical flyers around town, many buyers and sellers opt to use them online, especially on social media. According to Inside Real Estate, one in every eight minutes online is spent on Facebook, making that the best place to post your listing. For even more marketing potential, use the following tips for real estate advertising on Facebook. Have your friends “like” or “share” your Facebook post with the flyer. This will increase your audience to their circles in addition to your own. Buy an ad on Facebook, where you can target your audience based on items as specific as what pages they like or what groups they are in on Facebook. Create an event on Facebook for your open house. From this, you can invite people you believe might be interested and get the word out about your event. Social media is certainly a great way to promote a house that is for sale, but you don’t want to completely disregard the use of physical copies. You can also print the page after you design it and post it around town. This will reach an audience in the surrounding area if you post it on local businesses’ bulletin boards. You could also put a flyer through the door of each of your near neighbors, as they may know someone who is interested in moving to your locality. Another great place to put a printed flyer is on the for sale sign in your yard. This will make it easy for anyone who passes your home and is interested to get all the information at once. By making it easy for them to consider your house, you increase the likelihood they will attend your open house or schedule a showing. A few things should be taken into consideration when printing. You want to be certain your flyer looks professional so always make sure it is printed in color, which will enhance your images. While you can print it for free at home, it may be worth the extra cost to have it printed on a heavier weight paper to stand out from other posted flyers. 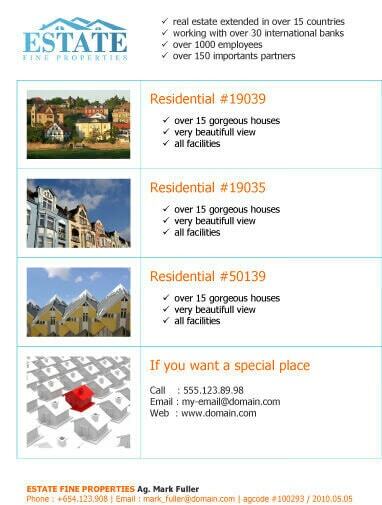 To help you begin, the real estate flyer templates are listed below. Simply download one of them and input your own information and photos. You can then start posting or passing them out yourself to market your listing. Contemporary design with 3 images, description, key features, and call to action button. Perfect for sharing on your website, on social media, or for printing. Listing with 6 images and real estate broker information in the footer. Modern design with one large image and two smaller images in circles. Space for both key points and long description. Simple tear-off flyer template with three images. 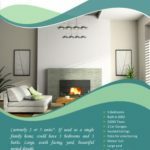 Single-image design with wave design elements - easy to use flyer template for your real estate marketing. Simple table design to show multiple properties on a single flyer. Can be single page or multiple pages. 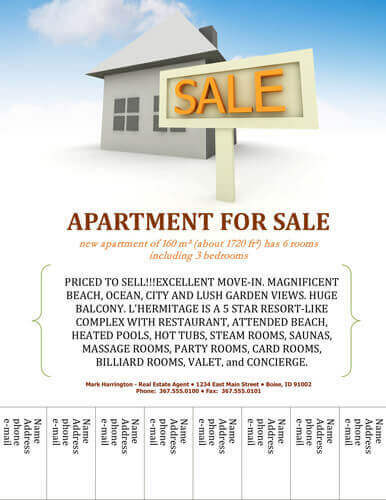 Marketing flyer with ample space for seven images, seller information, large price text box, and bullet points for key property information. Simple and easy-to-edit "for sale by owner" real estate marketing flyer for any property. Realtor flyer - basic design for real estate agents, real estate brokers, and all other real estate professionals. 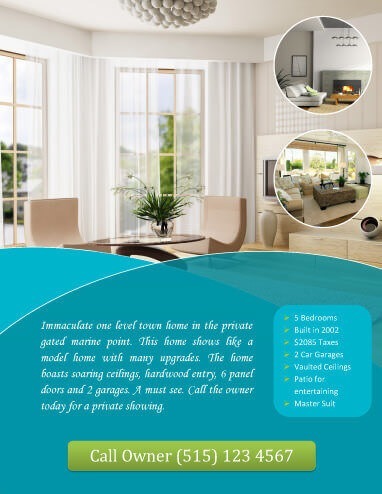 Very simple real estate marketing flyer design with single image and real estate / seller photo and contact information. Simple design for real estate agents. Simply remove agent photo to create flyer for listings by owner. Perfect solution for any marketing campaign. Free tear-off flyer, US letter size. Easy to print on homedesk printer.